Celia Hu from Girl Meets Cooking shares her favourite secret Sushi resto which is tucked away in Happy Valley. I debated quite a while before writing this post about Sushi Sumi, because this quaint little sushi joint feels somewhat like a best-kept secret for us. Tucked into a quiet, unassuming side street off of Sing Wo Road in Happy Valley, this meticulous little restaurant has been a neighbourhood favourite for at least over a decade – and that’s saying PLENTY considering how fast restaurants go out of business in capital intensive Hong Kong. The restaurant boasts a loyal following, with regulars such as ourselves who’ve tracked down the sushi-ya despite it moving from Bluepool Road to its current location. There are, of course, other good sushi places in Hong Kong, but Sushi Sumi always strikes a chord with us for its strict adherence to quality and consistency, and its unpretentious, relaxed atmosphere. We go for a sushi fix here at least once a month, and over the past 5 years, we’ve never, ever, had a bad experience. I also love how the sushi chefs and servers promote seasonal fish varieties, so there is always a surprise in store upon each visit. 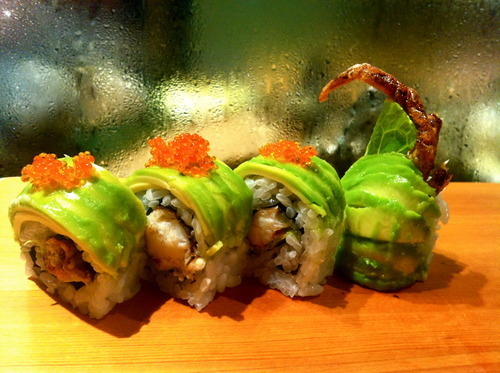 Below, are some of our favourites at Sushi Sumi. I love being seated at the sushi counter, as I get a ringside seat to all the action. It also reminds me of my sushi experiences in Japan. 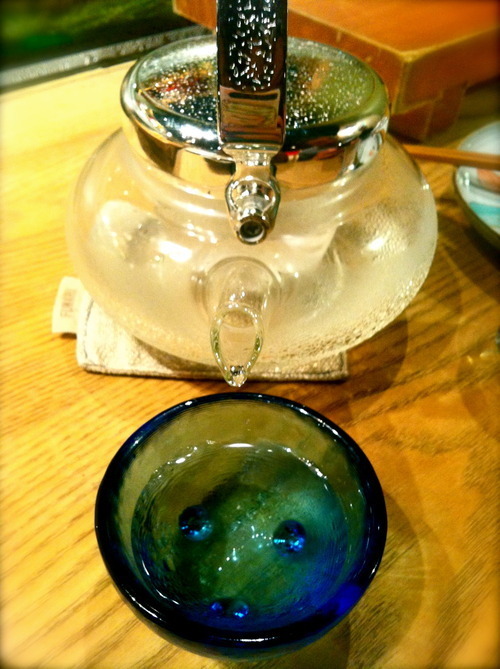 Sitting down with my menu, a hot towel and a cold pot of sake (although I’ve basically memorized the list by now!). I love how the server comes around with a tray of delicate glass sake cups for customers to choose from. 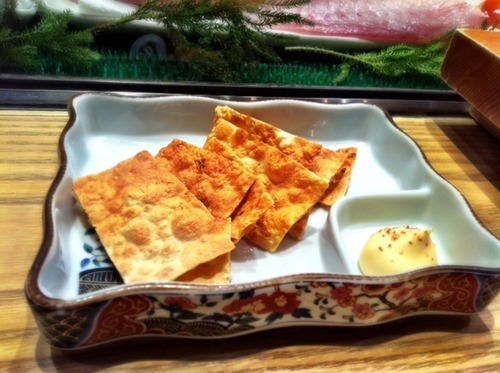 Crunchy, savoury fish crackers to start off the meal. 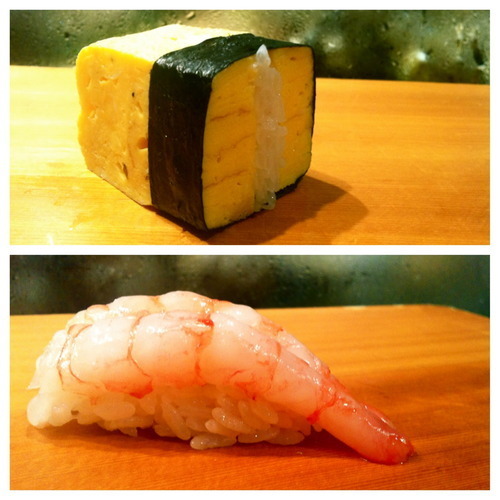 We choose our sushi based on seasonal fish varieties as well as some classic favourites. Salmon, ikura (salmon roe), uni, shima-aji (striped / yellow jack), hamachi (yellow tail), ama-ebi (sweet shrimp), scallop, and tamago are always on our must-order list. We also have a few seasonal favourites like aji (horse mackerel), saba (mackerel), sayori (half beck), and isaki (chicken grunt fish). Some fish are served with delicate dots of minced ginger, some are brushed with soy beforehand – we love asking the server for suggestions on unique and seasonal fish. 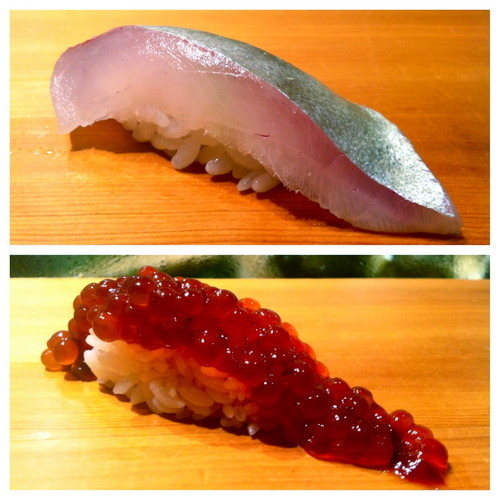 I love how the vibrant red ikura drapes over the sushi rice like a haute couture dress (below). I always save the tamago for last – the sweet, velvety texture makes this a perfect dessert! 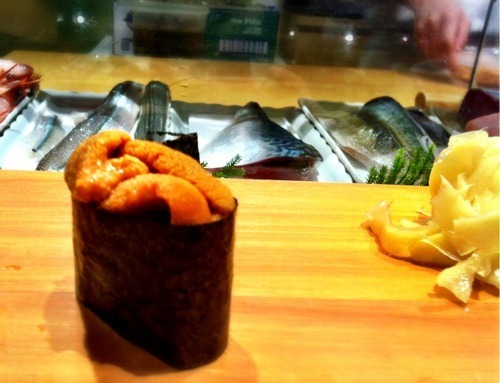 We love the Japanese uni – sweet, creamy, and oh-so heavenly. Each piece will set you back around HK$220, but remember, you are paying for quality here. Top quality sushi does not come cheap. 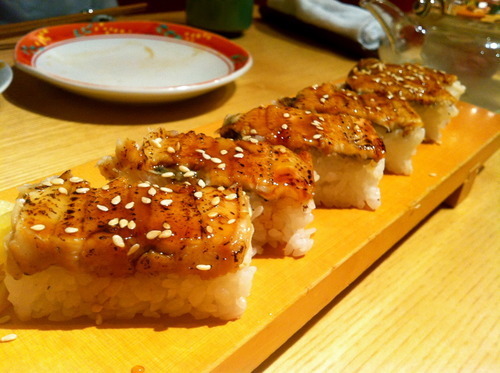 Our favourite, must-have roll – negitoro. 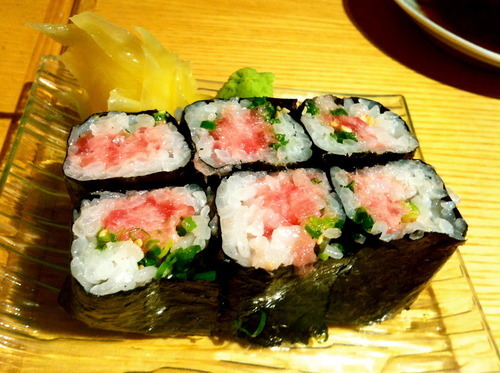 The garlicky green onion balances perfectly with the rich, fatty tuna belly. 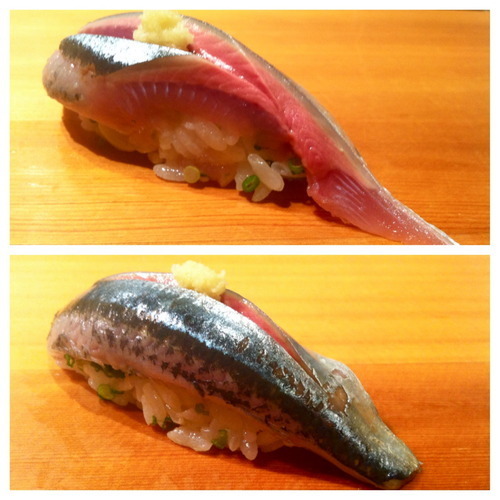 Another favourite – sweet anago pressed sushi. 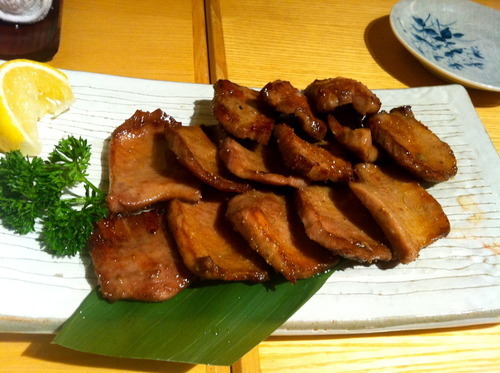 With all that fish, I like to create a bit of contrast with grilled skewers of ox tongue. 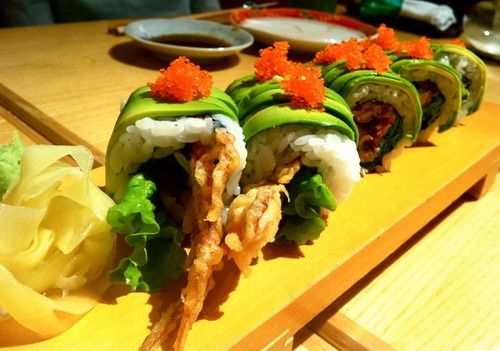 I love Sushi Sumi’s soft-shell crab roll. The crab is freshly fried, crispy yet light and still hot when it arrives at the table. 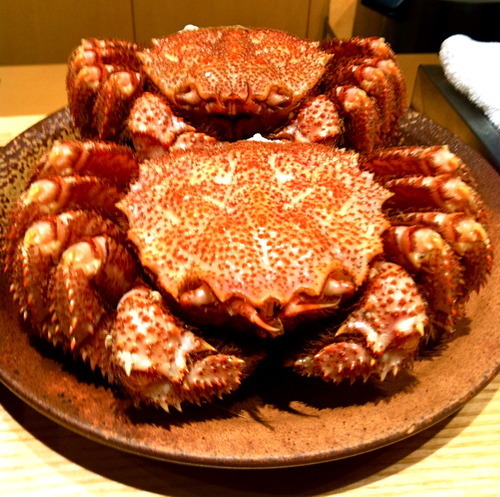 The Hokkaido crab is upon request only and based on seasonality. These little monsters look intimidating with their hairy spikes, but not to worry – the chefs will disassemble and tease out all the meat for you so you can dine in effortless ease. 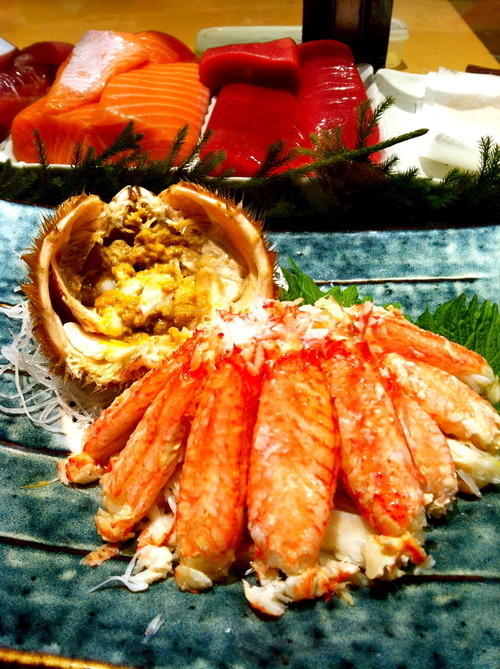 The crab meat is juicy, sweet and dripping with umami flavour. Some times, there are also tiny crabs available (you’ll usually see them in a glass bowl on the sushi counter) and the best way to eat them is to fry them up and crunch on the whole crab. I call these “sleeping pill crabs” because I always get super sleepy after eating them – go figure! What can I say? I love this place! I’ve dined at some of the best Michelin-3 star restaurants in Tokyo, and yet, I still crave the taste of this humble little sushi-ya. I love the relaxed, easy atmosphere, and how the chefs and servers have great rapport with the loyal clientele. The quality of ingredients is always fresh, and most importantly, always consistent. I have not seen standards slip even once over the 5 years I’ve been coming here regularly. 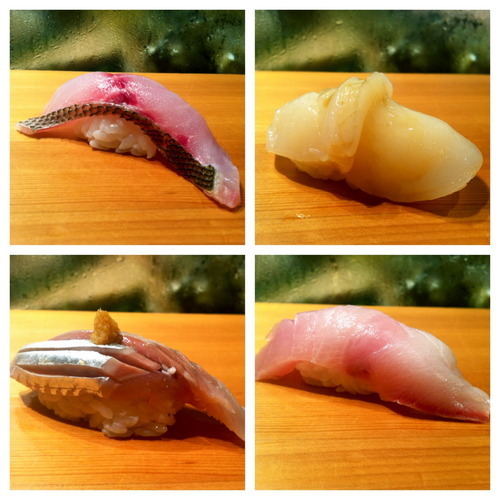 This sushi-ya is truly a gem, and I hope, still somewhat of a neighbourhood secret. Celia’s Hu’s love affair with food began at an early age, when her hearty appetite as an infant forced her parents to search the ration-ticketed Beijing of the early 80’s for black market milk when she exceeded the daily 3 bottle government allowance. When her family moved to North America, her appetite quickly expanded to encompass the bountiful fast food continent. Today, she is a more sophisticated glutton, having travelled and lived in many regions with contrasting and tantalizing local food cultures. Now residing in Hong Kong she hopes that her cooking and reviewing escapades can inspire you to also try something new. See more on Celia’s blog.